Gastritis can be defined as inflammation, irritation or erosion of the lining of the stomach, known as the gastric mucosa. All or part of the gastric mucosa may be involved, thus it can be classified as acute or chronic. Symptoms of gastritis vary from person to person, and many people have no symptoms at all. However, the most common symptoms are nausea, vomiting, a feeling of fullness in the upper abdomen after eating, a burning or gnawing feeling in the stomach between meals or at night, indigestion, heartburn, abdominal pain, loss of appetite, dark stools and bloating. 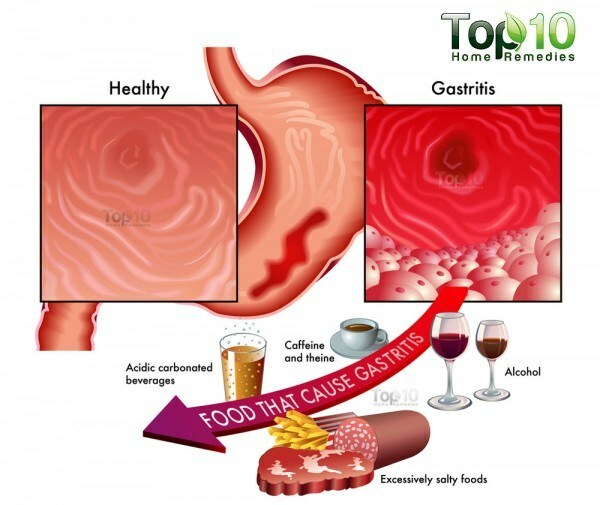 While there are several reasons why people suffer from gastritis, there are four primary causes: infection of the stomach mucosa by the Helicobacter pylori bacteria, vitamin B12 deficiency, taking too many pain relievers or other anti-inflammatory drugs, and acidic and spicy foods and drinks. Those who drink too much alcohol, older adults and people suffering from diseases and conditions like HIV/AIDS, Crohn’s disease and parasitic infections are at a higher risk of getting gastritis. 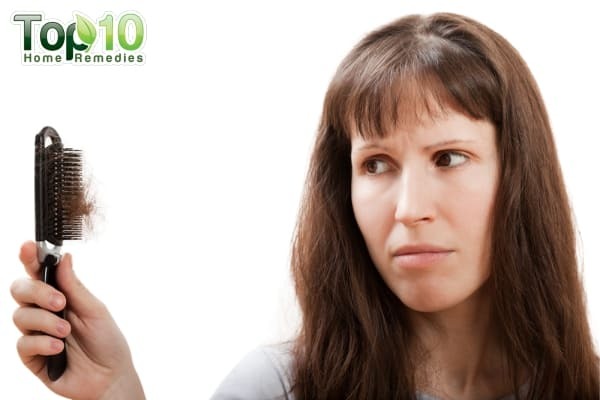 Viral or fungal infections and stress can also be contributing factors. Mild cases of acute gastritis usually clear up within a few days. 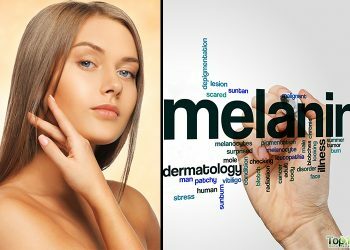 Plus, you can try simple home remedies along with lifestyle and diet modifications to prevent and control the problem. However, if you suffer from chronic gastritis and experience a lot of discomfort, it is advisable to consult your doctor as it can lead to ulcers. 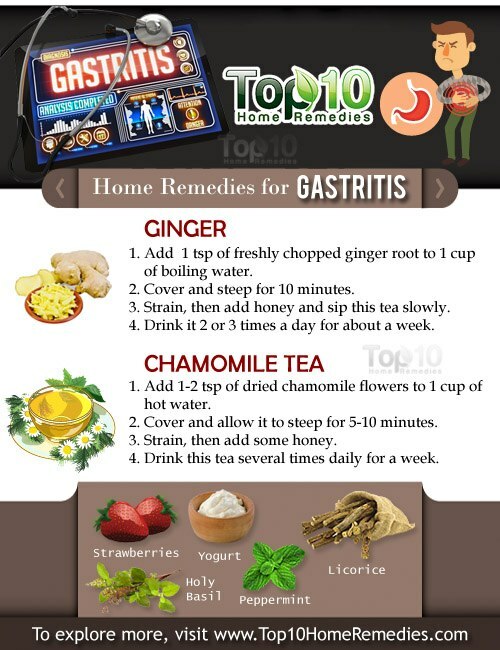 Here are the top 10 home remedies for gastritis. Carom seeds are a natural antacid that is beneficial for gastritis. They provide relief to the stomach’s mucous membrane from acidity and hyperacidity. Carom seeds can also treat indigestion, nausea and bloating. Mix together 1 teaspoon each of carom seeds and dried ginger with a little bit of black salt. Take 1 teaspoon of this mixture with a glass of warm water 3 times a day. Another option is to add 1 teaspoon of carom seeds powder and ½ teaspoon of black salt to a glass of buttermilk. Drink it 2 times a day. You can also boil 2 cups of water with 4 teaspoons of carom seeds until the water reduces by half. Strain the mixture and drink ½ cup of it 2 times a day. 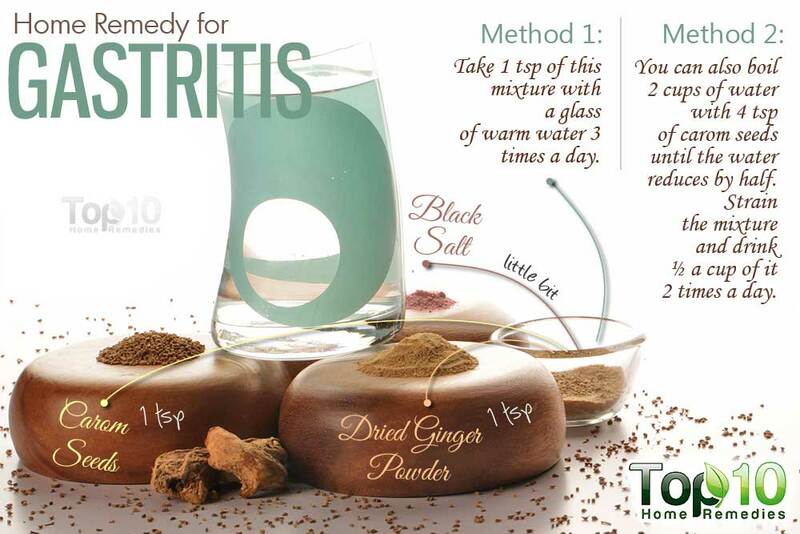 Follow any of these remedies until the gastritis symptoms go away. Ginger can also effectively treat gastritis due to its anti-inflammatory and antibacterial properties. It can reduce inflammation and treat the infection as well as alleviate symptoms like stomach pain, gas, indigestion, nausea and bloating. Add 1 teaspoon of freshly chopped ginger root to 1 cup of boiling water. Cover and steep for 10 minutes. Strain, add honey and sip this tea slowly. Drink it 2 or 3 times a day for about a week. Alternatively, mix together ½ tablespoon each of ginger juice and honey. Take it before eating your meal 2 times daily for a week. You can even chew a small piece of fresh ginger root or take ginger capsules to treat gastritis. Note: Ginger may interfere with blood-thinning and high blood pressure medications. Yogurt is a good addition to your diet, especially when suffering from gastritis. Yogurt with active live cultures is particularly beneficial in this regard. The probiotics present in yogurt help protect your stomach lining from H. pylori bacteria that causes gastritis. Also, yogurt boosts the immune system to fight off infection more quickly. Eat 2 to 3 cups of plain probiotic yogurt daily until you get relief. You can also try a yogurt, banana and honey smoothie. Drink it 2 or 3 times a day for quick recovery. Chamomile tea may also be very helpful in treating gastritis. It is rich in certain essential oils that are beneficial for the digestive system. It can even soothe the intestinal walls, providing relief from sudden pains, and eliminate gas. Plus, it can reduce stomach inflammation and thus reduce the risk of ulcers. Add 1 or 2 teaspoons of dried chamomile flowers to 1 cup of hot water. Cover and allow it to steep for 5 to 10 minutes. Strain, then add some honey. Drink this tea several times daily for a week. Note: Do not boil this herb as its active compounds will be destroyed. Peppermint is another herb known to treat gastritis due to its anti-inflammatory, antibacterial and antispasmodic properties. Its soothing properties can reduce inflammation of the stomach lining. Plus, it can help reduce nausea, indigestion and heartburn. Take standardized, enteric coated peppermint tablets. Usually, 1 tablet 2 or 3 times daily is recommended, but it is best to consult a doctor before taking it. Enteric coated tablets will help avoid heartburn. You can also chew fresh peppermint leaves or add them to your soups, salads and smoothies. Strawberries can also help heal gastritis due to their antioxidant property and high content of phenolic compounds. It can help prevent the start of inflammation in the stomach lining. In a 2011 study, European researchers concluded that regular consumption of strawberries can help reduce the harm that alcohol causes to the stomach mucous membrane. Add 1 tablespoon of dried strawberry leaves to a cup of hot water. Let it steep for 5 minutes, then strain. Drink it 2 or 3 times daily until the gastritis symptoms subside. To prevent gastritis, eat a few strawberries daily. 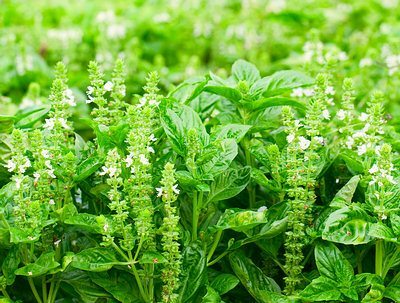 Holy basil has also been found to be very effective for treating acute gastritis. Its anti-inflammatory and antibacterial properties help decrease inflammation and reduce infection caused by the H. pylori bacteria. It can help treat symptoms like stomach pain, indigestion, vomiting and nausea. Chew 4 to 5 leaves of holy basil slowly to treat stomach pain. Do this daily for at least a few weeks. Another option is to mix 1 teaspoon each of basil juice and ginger juice and drink it 2 or 3 times a day for a week. You can also drink basil tea with honey 3 times a day for a few weeks. To prepare basil tea steep 1 teaspoon of basil leaves in hot water for about 5 minutes and then strain it. As fennel seeds help soothe the digestive system and relax the muscles in the gastrointestinal tract, they are highly recommended for gastritis treatment. Due to their stomachic, antispasmodic, anti-inflammatory and antibacterial properties, fennel seeds are beneficial in relieving symptoms like indigestion, bloating, intestinal gas, heartburn and vomiting. 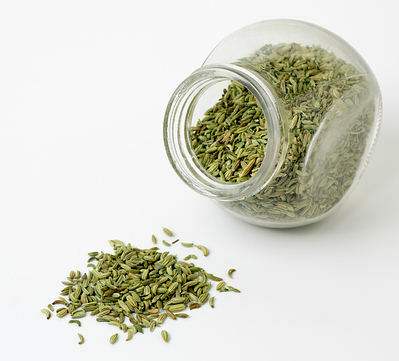 Add 1 teaspoon of fennel seeds to a cup of hot water. Cover and let it steep for 10 minutes. Strain and add a little honey. Drink it 3 times a day for a week. Also, chew fennel seeds thoroughly after a meal to relieve symptoms. 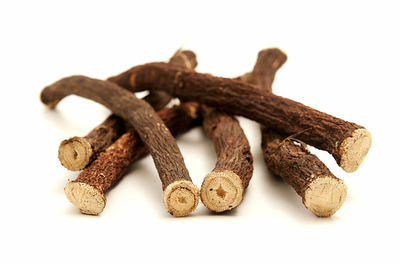 A popular Ayurvedic remedy for gastritis is licorice. Its anti-inflammatory and soothing properties can reduce inflammation and relieve symptoms like heartburn, a burning sensation in the stomach, indigestion and more. Also, it can protect the stomach’s inner lining from infection and reduce the risk of ulcers from gastritis. Add 1 teaspoon of licorice powder to a cup of hot water. Cover, steep for 10 minutes and strain it. Drink this tea 2 or 3 times a day for a week. You can also take 250 to 500 mg of standardized deglycyrrhizinated licorice, or DGL extract, 3 times a day. If you are taking any other medicine, consult your doctor first. Another effective remedy for gastritis is raw potato juice, thanks to its antacid and healing properties. 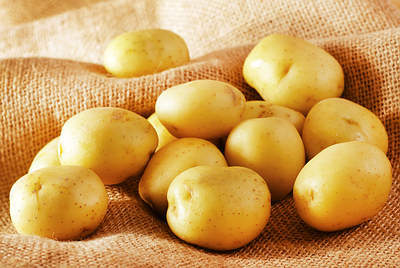 The alkaline properties of potatoes help reduce bloating, cramping, excess gas and other symptoms of gastritis. Peel 1 to 2 raw potatoes and grate them. Put the grated potatoes on a strainer and press with a spoon to extract the juice. Dilute 1/2 glass of potato juice with a little warm water. Drink it 3 times a day, 30 minutes before each meal, for at least 1 to 2 weeks. Drink 2 cups of coconut water every day. Cut back on red meat, red peppers, sour food, pickles, tea and coffee, sweets and aerated drinks as they may irritate the stomach lining. Avoid dairy products until the digestive system is healed. Regularly drinking green tea may prevent chronic gastritis. Eat your dinner at least 2 hours before going to bed. Eat slowly and make sure to chew thoroughly to facilitate proper digestion. Eat small meals at regular intervals to help reduce any excessive acid buildup in the stomach. Avoid drinking water with meals as this can delay digestion. Drink an ample amount of water throughout the day to keep many symptoms of gastritis at bay. For gastritis due to anemia, take supplemental chlorophyll after consulting your doctor. You can take supplements of vitamins B12, E and C to help your body heal quickly. Maintain a food diary to find out what triggers gastritis and try to cut back or eliminate those foods from your diet. Quit smoking as well as reduce or eliminate alcohol intake. Minimize stress through meditation or yoga as it can worsen the condition. If you are taking any medicines, consult your doctor as certain medications can aggravate your stomach problem. Was very helpful. Thank you very much ? “Cut back on tea…” Yet regularly drink green and chamomile tea. “Avoid dairy products…” Yet eat lots of yogurt. Which is it? Tea has Tannin which you need to avoid. An infusion of Cammomile does not have Tannin. Yogurt is probiotic. The good bacteria help in balancing the flora of the intestines. Very helpful and educational..am diagnosed w acute gastritis.. this could help me a lot..thanks.. Very helpful.. educational..am diagnosed w acute gastritis.. this could be of help.. thanks..
Home remedies are the best friend of mine. When I have any problem I want to see home remedies. Really very beneficial. Thanks a lot. Does anyone know if kombucha is good or bad for gastritis? I’ve been drinking 16 oz every day. I love it and it’s totally helped me to get off my soda addiction. I developed what I think is gastritis but i don’t know if it’s partly because of or despite kombucha. Its a probiotic but the one I like has a lot of lemon in it and it’s fermented so it can make you feel bloated. Small amount of alcohol, but maybe since I’m drinking it every day the alcohol is wearing down the stomach lining. 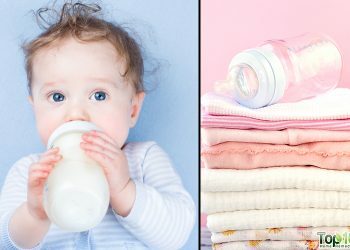 very nice article and tips. I always prefer yogurt or banana as it come in handy. Hi, I am suffering from abdominal pain from more than an year. I repeatedly get inflammation in my stomach and the big intestine. Is there any home remedy which can completely cure my stomach and the big intestine. Medicines seems to work only when taken regularly. When I stop taking medicines the above symptoms appear after some time. You may have an reoccurring infection known as Helicobacter pylori bacteria. If this isn’t treated properly, the infection could remain there for very long. It can only be treated by Antibiotics such as (Amoxillin). U might be taking different medications, which perhaps is only helping calm the problem but not kill it. And if Helicobacter pylori bacteria is the underlying cause, then you definitely need to kill the bacteria. Get a check up for this. 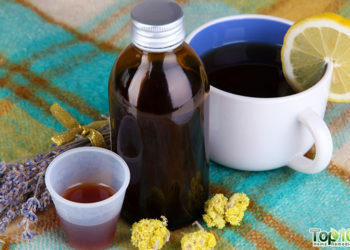 I agree that some of these remedies (like Chamomile tea and ginger) can be very helpful. Yet I don’t think all of them would be safe alternatives. For example, yogurt wouldn’t be a very good choice since diary can cause more inflammation. However, probiotic supplements (like Acidophilus) would be a better choice. The same holds true with strawberries. The small seeds on the outside of the strawberries can actually irritate the stomach lining even more. A better choice would be bananas, papaya, melons, and mangos. Lastly, peppermint can be a double-edged sword. It works for some, but is irritating for others. So it should be used with caution. I am surprised to not see Licorice root on the list, though. That is a top choice for many. There are even DGL pills to help avoid the possible issue of high blood pressure. For those who don’t want to take that risk at all, Slippery Elm would be a suitable alternative. I am suffering from stomach erosion and i frequently face this, and i am going to try this whether it relieves. Useful. Thank you for the advice , wanted to find out about apples, some Dr’s recommend it as a remedy others do not so which is whic? I have chronic gastritis. Stress usually triggers it or when I get very bad period cramps I take ibuprofen which will also sets it off- so period pain is gone but gastritis pain comes 🙁 Anyway I find that yogurt makes it worse and banana and ginger! 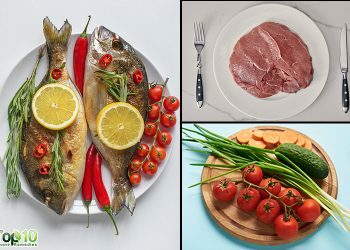 The best thing to eat is plain lean protein because protein lines the stomach also boiled eggs are great.Don’t eat fatty oily foods, spicy or acidic foods including strawberries!!. Take probiotic tablets,. Stick to plain water,avoid caffeine and coffee even decaffeinated coffee because coffe is acidic and so is milk! I feel Lik always vomiting sensation after eating especially, what is this, why it’s happening, what can I do, can anyone please tell me some remedy?